MANATEE -- Negotiations over compensation have made little progress after a Manatee County Emergency Medical Services protest in downtown Bradenton in November, . Negotiations will continue into 2016 between Manatee County government and the International Association of EMTs and Paramedics Local 747, the Manatee County union, about a labor agreement, including the salary/wage issue. The union, which has been negotiating with the county since 2013, organized the protest due to the failed attempt to reach an agreement. The county contacted the union the day of the protest asking for another meeting. Negotiations continued during a December meeting and another negotiation meeting is scheduled for Wednesday. "We had some hopes that maybe they were going to bring something else to the table, which they didn't," said Dan Schuler, vice president of the Manatee County union. "Why they wanted this meeting, we don't know, because they brought nothing." The Manatee County union protest targeted low wages, forced overtime and other first-responder workplace issues. 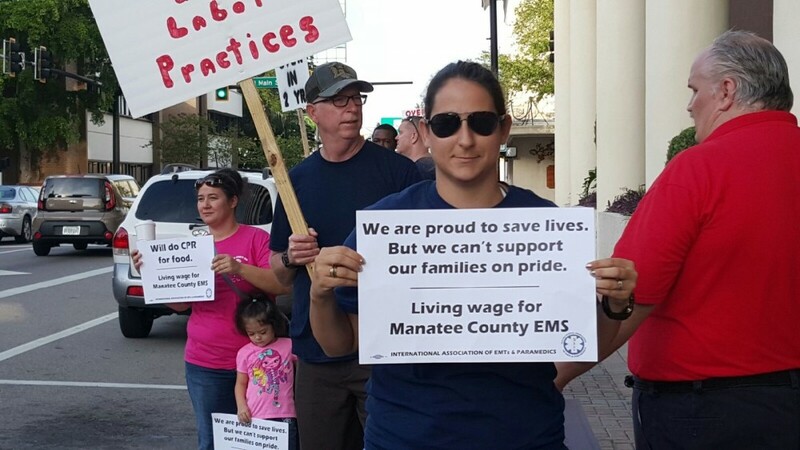 More than 30 Manatee County EMS paramedics and their families participated in the protest. The union recently presented a fourth proposal for discussion at the negotiation meeting. The latest proposal calls for employee at the county for more than a year but less than two years to earn roughly $1,500 more a year. Employees at the county longer than two years would receive about $3,000 more per year. "It's based on what you are currently paid," said William Shick, union president. "That would be for those that are already here." Shick said the union proposal calls for moving the pay scale adjustment over the next four years so you are not penalizing people that are already here, have been here and put in the time. Manatee County presented the union with a proposed compensation scale Sept. 29 to raise the annual pay range for paramedics from "$35,443 (minimum), $46,076 (midpoint) and $56,709 (maximum) to $40,648 (minimum), $51,417 (midpoint) and $62,366 (maximum)," according to the county negotiations update dated Nov. 17. The union rejected the proposal saying it only benefits new employees, Shick said. "The offer they put on the table adjusted the pay scale adjustment and took care of nobody else," he said. "Anybody that has been here more than eight to 10 years would be getting no adjustments over current salary." Nick Azzara, county spokesman, said "we will continue to negotiate in good faith for as long as the union wishes to negotiate." The county update indicates most EMTs and paramedics work 10 days a month versus other employees who work up to 23 days during the same period. Schuler said, while this is true, it equates to 240 hours per month versus 160 hours for other employees. The update also said "the parties have mutually agreed to the schedule and pace of meetings held." "It was nothing mutually agreeable about it," Shick said. "I wanted to come in twice a week, three times a week. We wanted to meet more. Everything was an excuse." Schuler said they've spent the last year negotiating with people who won't negotiate. "Their end game has been the budget is the budget. We have a number we can't move past that," he said. "We put four proposals in front of them and each time they've just said no and not come back with anything else and to me, that's not negotiating. Our problem is that we are sitting at the table with people who don't have the authority to negotiate and they don't have the willingness and they don't have the ability to convince the people that have the ability to negotiate, the commissioners, to move off of that number." During negotiations, union and county officials have no back and forth, Schuler said. "They have not come to the table to work on this," he said. "They've come to the table to say this is what we are going to do. It would be one thing if they said this is the amount of money we have to deal with, how can we make this work? But they will not have conversation with us at the table." The dollar amounts in the union's proposal are not astronomical, Schuler said. "We are not asking to be the highest-paid service in the state. Not even close," he said. "We are asking to be compensated for what we missed since we started negotiating and we are asking to being brought up in some sort of equitable wage." Despite the lengthy negotiations, Schuler said he believes the county's end game is to force a contract onto them. According to Schuler, Florida law allows the county to force the first contract on the union. "Everything we've agreed on and have tentative agreements on, they will go in place, but everything that we've deadlocked on, they get to pick," he said. "I honestly think that their plan coming into this is we are going to tell them what we are going to do and we can always force it on them. ... To me, it is just kicking the can down the street because it's going to just be even worse after a year and we are going to have arbitration after that."